Keep in mind though how SMR technology works - it records new magnetic tracks partly overlapping the previously recorded tracks in a 'shingle roof tile' fashion. This method is appropriate for sequential writes, but as multiple tracks need to be adjusted when re-writes occur, it slows down the rewriting process. As a result, SMR-based HDDs are good enough for archive as well as write once read many (WORM) applications (think content delivery services), but is not suitable for typical server or enterprise workloads. 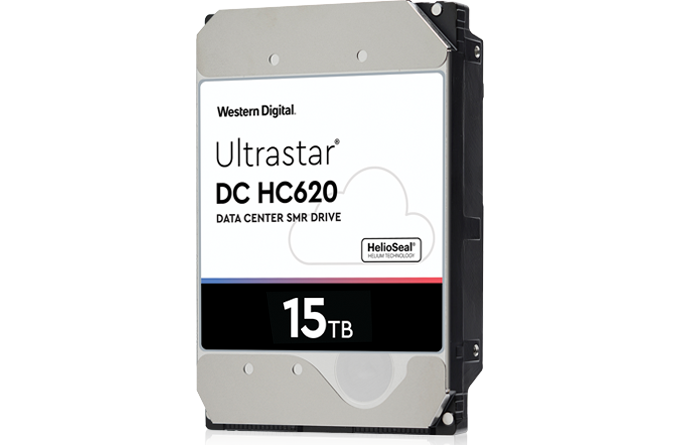 Another thing to point out about high-capacity HDDs in general and Western Digital’s Ultrastar DC HC620 15 TB in particular is the fact that as capacities increase, IOPS per TB performance drops and it gets increasingly harder for operators of datacenters to guarantee their customers expected performance and quality of service. Therefore, while technically the Western Digital’s 15 TB is the world’s highest-capacity hard drive that exists today, it is necessary to understand that this is a very special product aimed at select customers with systems that take into account peculiarities of SMR and can mitigate lower IOPS per TB performance to minimize impact on QoS. 4 = Like so, we flipped a bit on 0 to 1, and like now it takes a few days for what flippin' that bit did. Meaning, like you pay us, like a ~lil extra~ and we'll like, flip that bit back to 0 for ya. These massive capacity drives tend to be rather expensive, and a single pass overwrite can take > 24 hours. That makes instant secure erase an attractive feature if you deal with customer / confidential / regulated data and want to be able to quickly repurpose a drive instead of just shredding it and shelling out for a new one. Instant secure erase is enabled by making the drive self encrypting and just chucking the keys when you issue a SATA secure erase command. However, if anything happens to the controller where those keys are stored you end up with a failed drive and very little possibility of performing data recovery. If the drive is being used for archival of non-sensitive data, customers might prefer to fail-safe rather than fail-secure. I think you have me confused with Alucard.